A Wild Turkey is an amazingly resilient bird, capable of surviving in a variety of habitats. Americans will come together this week to celebrate Thanksgiving, so I thought I’d focus this week’s column on the wild turkey. It’s usually in early November that I begin encountering wild turkey flocks, whether I’m in the field to look for birds or simply driving to and from work. 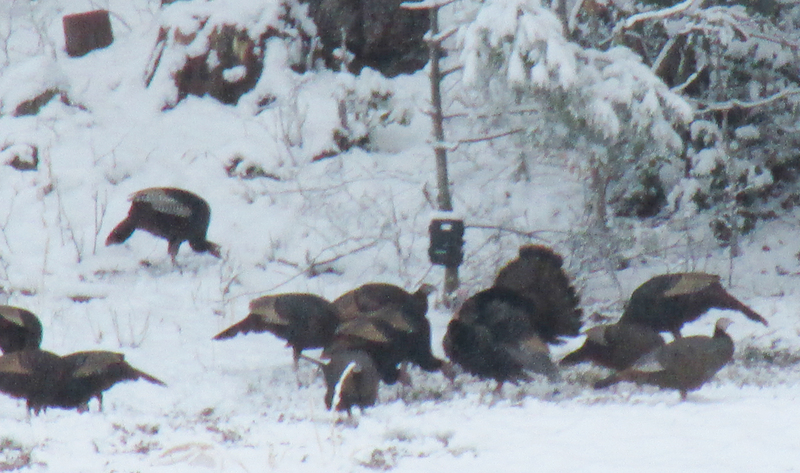 I saw a group of four wild turkeys on Nov. 4 as they foraged in a field near my home. Over the years, I’ve also found other locations that are dependable for turkey sightings. 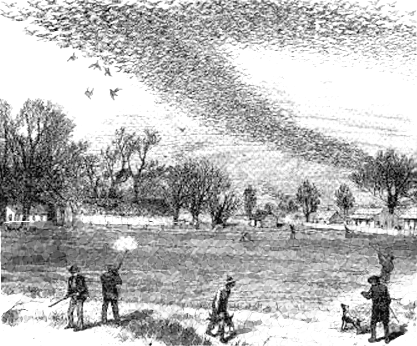 In some areas, flocks comprised of dozens or even hundreds of turkeys are commonplace. 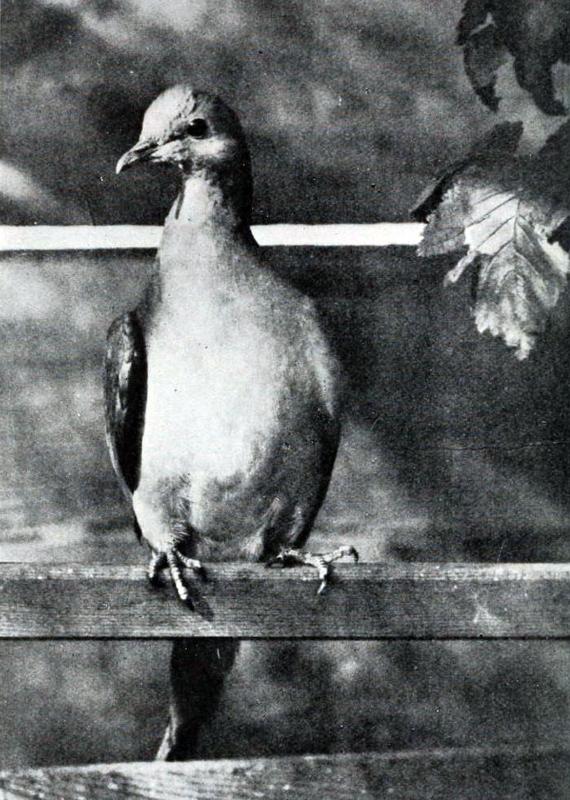 This bird, one of the last Passenger Pigeons, was photographed in 1899. Surprisingly, despite its current abundance across North America, the wild turkey almost didn’t survive the 19th century. It’s almost miraculous that the wild turkey didn’t join the unfortunate ranks of such extinct birds as the passenger pigeon and Carolina parakeet. In fact, only an estimated 30,000 wild turkeys were alive about 1930. The same forces that wiped out the immense flocks of passenger pigeons and America’s only wild parakeet almost drove the wild turkey to extinction. Habitat destruction and a merciless commercial slaughter almost claimed the wild turkey, another uniquely American bird. The same market forces that slaughtered Passenger Pigeons nearly decimated America’s Wild Turkey, too. Ironically, the wild turkey’s valued status as a gamebird helped persuade many Americans to fight for its conservation. It’s an effort that succeeded admirably. Today, there are about seven million wild turkeys roaming North America. The wild turkey is now abundant enough to be legally hunted in most states, including Virginia and Tennessee. Interest in the wild turkey as a game bird has even inspired the establishment of the National Wild Turkey Federation, which is a national nonprofit organization that serves as a leader in upland wildlife habitat conservation in North America. The NWTF was founded in 1973 in the Commonwealth of Virginia. The NWTF is now headquartered in Edgefield, South Carolina, and has local chapters in every state. The NWTF remains dedicated to the conservation of the wild turkey and the preservation of a sustainable hunting heritage. 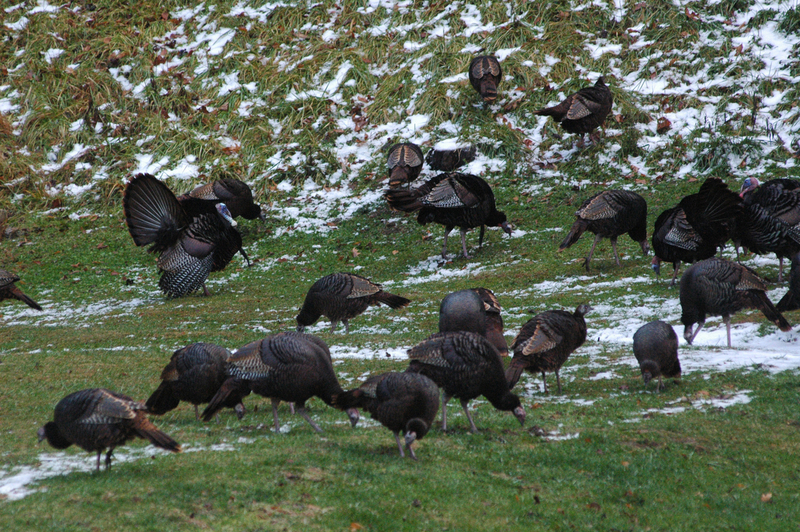 A flock of turkeys forage for food while a few of the males, or Toms, display to attract the attention of females in the flock. The wild turkey, for which the NWTF was formed, is a large bird. Males, or tom turkeys, can reach a length of 46 inches, weigh 16 pounds and boast a wingspan of 60 inches. It’s a widely held misconception that the wild turkey cannot fly. The turkey is perfectly capable of flying at speeds up to 55 miles per hour, but they often prefer to walk and run over the ground. They’re good sprinters, in fact, and can reach a running speed of 25 miles per hour. The female turkey, or hen, nests, incubates eggs and rears young without any help from her mate. The hen may lay as many as a dozen eggs. The clutch usually hatches within a month. Newly-hatched turkeys are known as poults. The poults are capable of finding their own food after leaving the nest, which they do within 12 hours of hatching. They are supervised, however, by the hen. Wild turkeys require a mixture of woodlands with clearings and fields to thrive. They roost in trees at night, but feed in more open habitats. 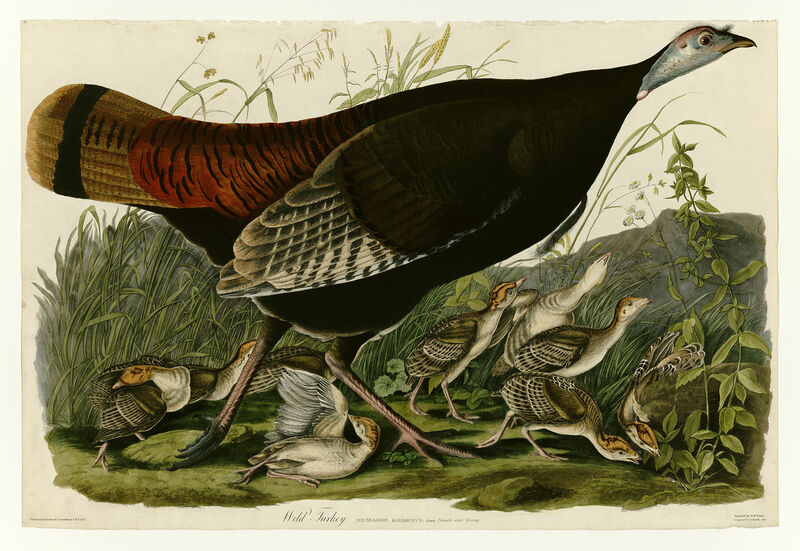 Early naturalist John James Audubon painted this wild turkey hen accompanied by her poults, or young. The wild turkey’s scientific name is Meleagris gallopavo. The wild bird is exclusively resident in North America, but domesticated turkeys are now raised around the globe. The wild turkey has only one close relative, the ocellated turkey, or Meleagris ocellata, which ranges throughout the Yucatán Peninsula in Mexico as well as the northern parts of Belize and Guatemala. The extent of this fowl’s range is only about 50,000 square miles while the wild turkey ranges throughout the United States, as well as Canada and Mexico. Tail feathers in both sexes are bluish-gray in color with a well defined, eye-shaped, blue-bronze colored spot near the end followed by a bright gold tip. These “eyespots” in the feathers provide the basis for the use of the term “ocellated” in this fowl’s common name. The tail feather spots are reminiscent of those seen in peacock feathers. Few birds have featured so prominently in the history of the United States as the wild turkey. In fact, the turkey came close to being named the official bird of the United States. Benjamin Franklin, who proposed the turkey as the official United States bird, was distraught when the bald eagle was chosen over the turkey. Franklin wrote to his daughter, referring to the eagle’s “bad moral character,” saying, “I wish the bald eagle had not been chosen as the Representative of our country! The turkey is a much more respectable bird, and withal a true original native of America.” George Washington, the nation’s first president, also shared Franklin’s opinion, and pointed out the bald eagle’s lifestyle as a carrion eater. The Wild Turkey has become closely associated with the Thanksgiving holiday. If not as our national symbol, the wild turkey is still deserving of respect. This bird, found only in North America, is a survivor. • The Aztecs first domesticated the wild turkey. Spaniards brought this tamed fowl back to Europe with them in the mid-16th century and from Spain, domestic turkeys spread to France and later Britain as a farmyard animal. • At Thanksgiving, humans consume many turkeys. In the wild, turkeys are preyed upon by coyotes, bobcats, cougars, golden eagles, great horned owls and red foxes. • Today, the wild turkey population stands at about 7 million. This bird, an adaptable species, now thrives in suburban areas, as well as the rural countryside. • The feathers of turkeys were important in Native American cultures. Tribes as diverse as the Sioux, the Wampanoag, the Powhatan and the Hopi all wore turkey feathers or used feathers in their rituals. 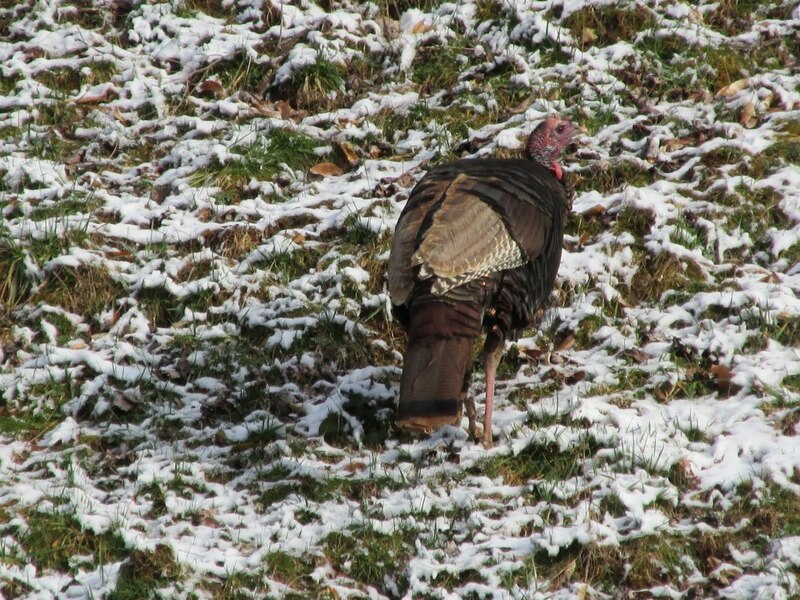 The thaw after a snow makes it easier for wild turkeys to forage for food. • Turkeys belong to an order of birds known as the galliformes, which includes grouse, ptarmigans, pheasants, quail, partridges and chickens. The only other native galliformes in the regions are ruffed grouse and Northern bobwhite. • The wild turkey is the largest of North America’s game birds. The largest wild turkey on record weighed 37 pounds, but a domestic turkey holds the record, tipping the scales at 86 pounds. That bird certainly could have fed a lot of people gathered around the Thanksgiving dining table. 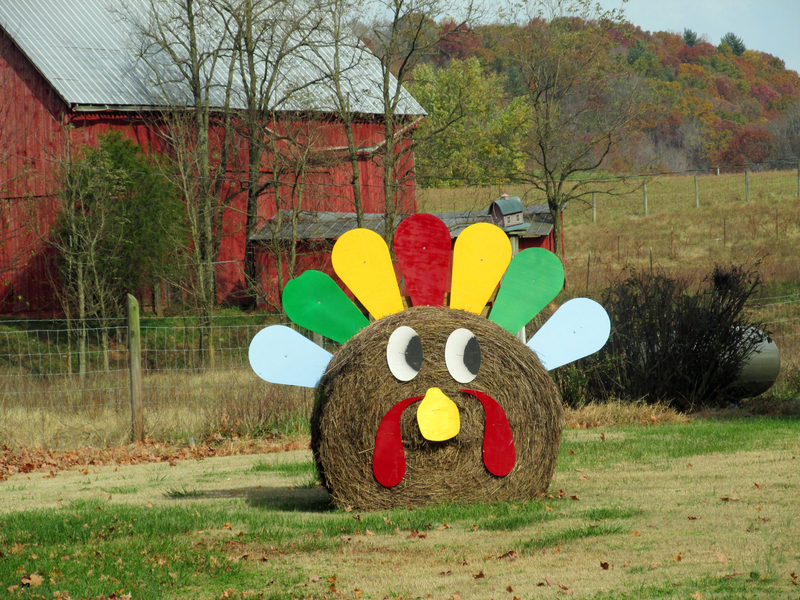 A decorative turkey made from plywood and a haybale pays homage to the real bird. 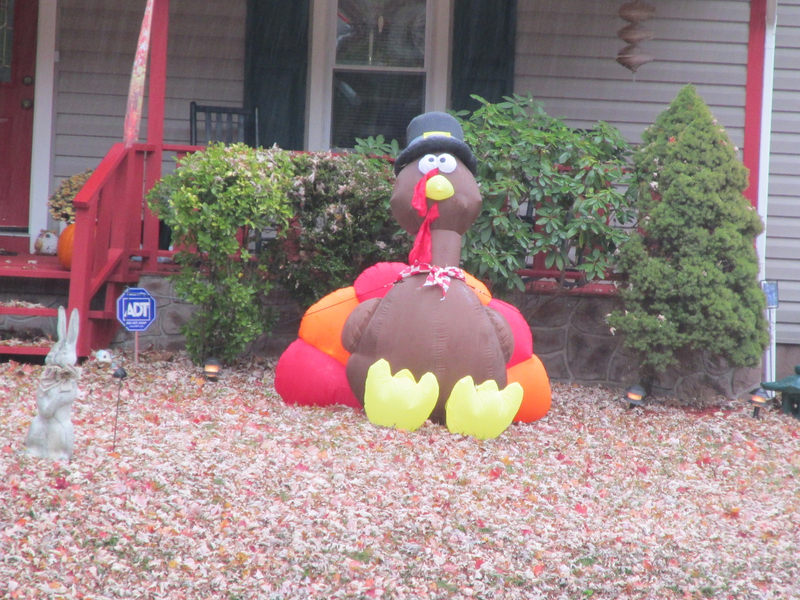 This entry was posted in Birding, Birds and tagged Birding, Elizabethton Star, Erwin Record, Feathered Friends, Meleagris gallopavo, Our Fine Feathered Friends, Passenger Pigeon, Thanksgiving, Thanksgiving traditions, Thanksgiving trivia, The Erwin Record, Wild Turkey on November 23, 2014 by Bryan Stevens.